Isn't it funny how motivation works? Leading up to my 10k this past weekend, I was really struggling to stay motivated enough to continue training for it. Now, with no races lined up in the very near future, I'm suddenly brimming with it; I guess that's a good thing, seeing as I'm planning to tackle a marathon in November. As you can see, my weeks have been pretty spotty as far as running goes. Now, this isn't to say I'm not exercising on days I'm not running; the week after traveling for the wedding and all that, I didn't run at all, but I did T25 three days, including a double session on Friday. I've also noticed that some of my shorter runs have been really hard. My legs feel tired and stiff more often lately. I know it's starting to warm up and get humid again, and my effort feels the same (or more intense), but my paces are slowing down. My conclusion here is that I need to mix up my cross-training and make sure I'm giving my legs rest days; I also need to run at least three days a week to maintain my fitness and the mileage I feel happiest with. It has three days of running scheduled; I think this is ideal. Based on how I've been faring lately, I think three days a week of purposeful runs is a solid foundation. I like the idea that I could add a fun/easy run once in awhile if I wanted, and still avoid over-training. Taking a cue from Kristina, who has been running 10 miles every weekend and is seeing physical and mental results, I'm going to start adding consistent long runs back into my "non-training" schedule. Even though I'm not training for a specific race, I need to keep doing LSD runs if I want to maintain my confidence. So there's that. This week I've already done my bridge run at moderate effort (Monday), so everything else may shift a bit, but I'm looking forward to having a steady schedule to get used to. How do you plan your weekly workouts? How often do you cross-train? How many days a week do you try to run when you're not following a race plan? Your schedule looks very solid. I also like to maintain a long run each weekend when I'm not training for something. Then when you do want to start training for something, you don't have to start from square one! Yep, I'm hoping to avoid having to spend weeks building up; I'd like to just maintain a good level of fitness for when training begins! We are on the same page this week! 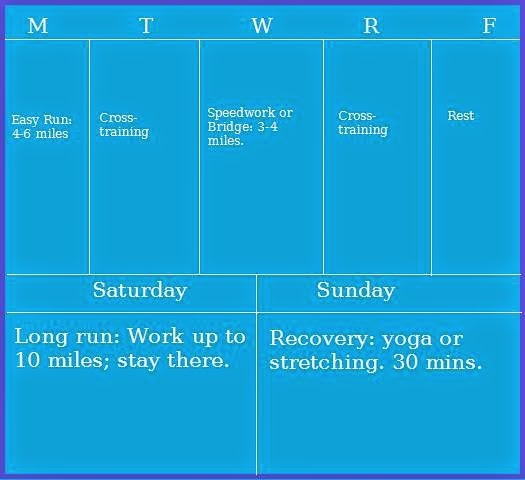 I was totally thinking of doing a schedule like that to build up mileage and be consistent with my pace! I totally want to work my mileage up and plan for Sat or Sun to be my "long run day." I was thinking of 10 miles as a good marker!!! It must be because we're both in the pre-planning phase for marathon training! I'll DM my number to you through twitter, so you can ask away! That schedule looks perfect for avoiding burnout and getting quality runs in! I plan 1 to 2 cross training days a week, but I need to focus on them more. I have no structure or routine for cross training these days and have been allowing myself to slowly elliptical my way through a TV show before leaving. I really should try T25 or something similar to maximize my XT time! I'm thinking I need to focus on upper body more. I do some much lower body/core, but my arms are neglected! That looks like a totally awesome schedule! I definitely agree on keeping your long run up to 10 miles for sure. it's good to have that solid base. I do not cross train near enough but I hope to do more of it when the weather gets warmer. I hope keeping my long runs at 10 miles will mean that one day 10 miles seems as "easy" as a 4 miler! WOOW! Yu are well planned! I am following you now on Bloglovin, maybe you wanna do the same? Thanks for the add :o) I'm excited to check out your blog. Your schedule looks awesome :) I really want to work up to 10 miles as well and just hang out there! For some reason 10 miles really does just seem like a perfect distance! Great way to refocus yourself. Easy miles have lead me to PB's this year....love easy miles! I definitely hope taking the pressure off and purposely keeping my days running to 3 will help prevent burnout and give my legs rest so I can see some improvement in pace! Great post Ali! It's so hard to find that magic balance between the running and cross training. Speaking from experience I ran better (and less injury prone) when I was lifting regularly and doing other cardio. Seems so hard these days to find the 45 minutes, but I am going to "tri" to get a better balance of cross training assuming I can start running again sometime soon.